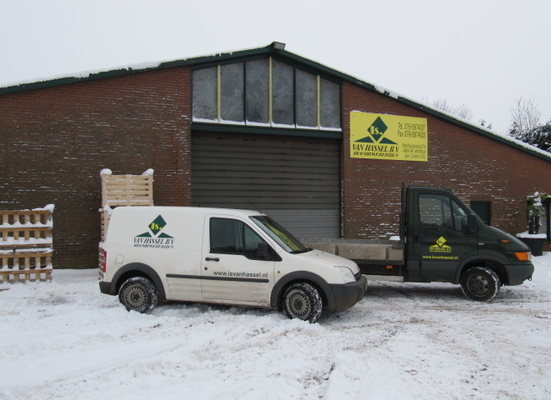 Our company was established around 1950 by Isidoor van Hassel. He started off cultivating softwoods and soon park trees and shrubbery followed. In 1974 the company was taken over by the brothers Frans, Ludo and Guust van Hassel. The company became a private limited company. Since 1980 slowly but surely a change in culture has taken place. Especially the cultivation of feathered transplants and avenue trees has taken a prominent place within our assortment. You can find Is. van Hassel B.V. nurseries in the south of the Netherlands, in the centre of nurseries Zundert . The nursery consists four groups of products: shrubs with root ball, conifers in species, feathers and trees. The products are grown on a acreage of 70 hectare. The assortment shrubs consist both native species and varieties. And are available with root ball or bare roots. The assortment of conifers consists a small number of species, with a leading cultivation of Pinus. The Pinus are grow in a number up to 50.000 and available in the sizes 60/80/100/+. Especially Pinus n. nigra and Pinus sylvestris are available in large numbers. The assortment of feathers mainly consist native species, the are two times transplanted and available up to the size 6/8. The assortment of trees also mainly consist native species, supplemented with a small number of varieties. The trees are mainly available in the sizes 8/10 up to 14/16. The organisation has both a production and a trading operation. Because of this combination we can offer you a total assortment of nursery products. When you send us a request by fax, our salesmanagers: Frans van Hassel and Arnoud Hoefmans will send you back an attractive offer. Of course you are always welcome to visit our nursery. To avoid confusion we recommend you to make an appointment when you want to visit us.